​Arsenal fans were dreading the early season fixtures as the Gunners were handed one of the toughest opening league fixtures the Premier League has ever seen. Fans were right to be fearful as Arsenal fell to both Manchester City and Chelsea in the opening exchanges of the season, leaving the Gunners with no points from a possible six. "The new manager knows what he wants," he told the ​Evening Standard. "Of course, the first two games were difficult for us because everything was new after Wenger. But now you can see we are going forward step by step. "We are in a good way and we want to continue that under him. He is a really good coach, he wants to understand the player, the club and we want to show him on the pitch what we can do. At the moment, it is going well but we have to work hard to reach our aim." 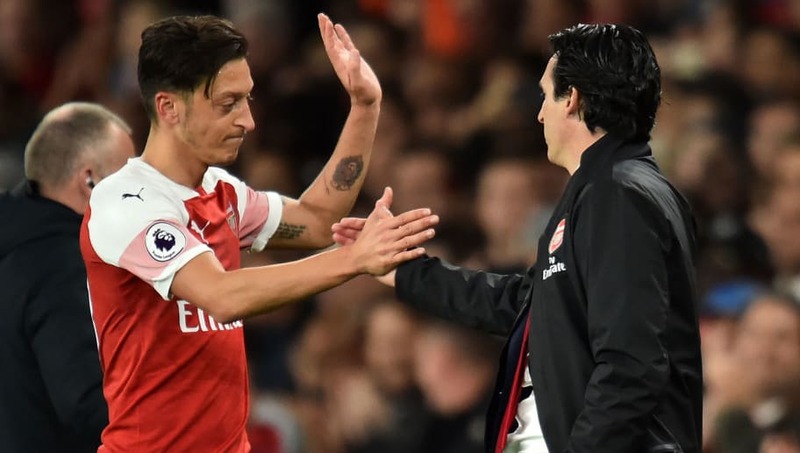 Ozil himself has had a good start to the season under new coach Emery, scoring four goals and adding an assist, and former teammate Mathieu Flamini credits Arsenal's upturn in form to the fact the players now understand what their boss requires from them. "And you can see from the outside, players know exactly what to do," he said, with Ozil nodding in agreement. "That’s the feeling I have. The team are well-positioned, well-structured and you can see when they lose the ball, they know how to get back into position. That is very important." Next up for Arsenal is a home fixture against newly promoted Wolverhampton Wanderers at the Emirates Stadium on Sunday.